We provide you with the specialty chemicals that are most difficult to obtain. In the increasingly complex marketplace, you might find that you require a unique raw material or service your current supplier cannot provide. Your supplier should be focused exclusively on specialty chemicals. B&S Group’s extensive network and knowledge of both markets and products enable us to focus solely on reliably sourcing the fine chemicals your processes require. In a few years, your organization will be an integral part of the fully globalized market, and you have responded to this change by focusing on specialized products that are the result of one-of-a-kind processes. You still acquire the more common chemical raw materials from the regular worldwide manufacturers, but the fine chemicals that are essential to your production process are sourced by a specialist. These specialists are necessary because the sheer number of chemicals, derivatives and possible suppliers have led to a complex and opaque market. You are currently starting to see a strong increase in the number of different chemicals and manufacturers, resulting in growing uncertainty. You cannot be sure if, a year from now, the demand for the chemical compound essential to your process will still be large enough for your current supplier to continue manufacturing it. It is also uncertain whether or not the unique compound that is at the core of your new future key product can be manufactured and sourced in smaller quantities. Many suppliers aim to produce large quantities of just a few multi-purpose chemicals, and therefore lack the focus, flexibility and know-how required to also fulfill more specific raw chemical material requirements. The B&S Group is a reliable supplier of fine chemicals. We also facilitate the essential connection between market demand, manufacturers, availability and product quality thanks to our extensive network. We have been building this network, and our expertise, for the past 30 years and it allows us to provide you with a solution to any problem you put to us. If you have a question or problem we will happily advise you about the ideal sourcing solution for you. Our personal bespoke approach ensures that customers are guaranteed high-quality, dependable service. B&S Group will hold stock for customers against forward orders allowing just-in-time delivery of key fine chemicals. 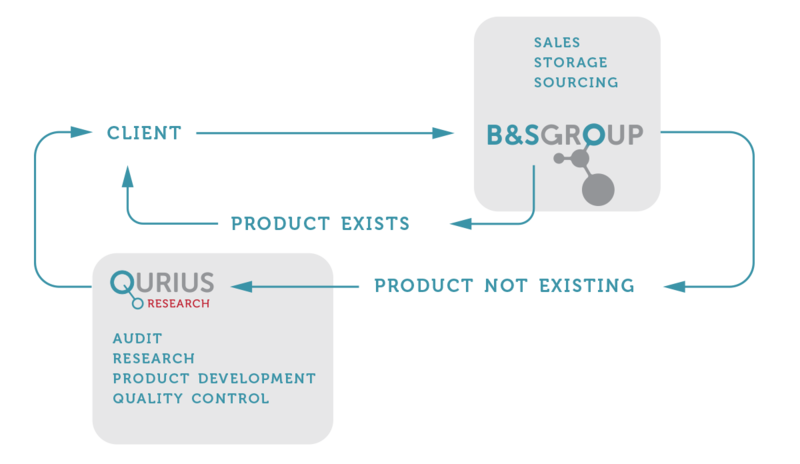 Our sister company Qurius Research initiates, develops and finances custom manufacturing projects for the pharmaceutical, photographic and speciality chemicals industries. When you would contact Qurius is shown in the flow chart below. Click on the image to visit our sister company specialized in the production of specialty chemicals. We have been focusing on fine chemicals for more than 30 years! The owner of B&S Group, André Sijrier, joined a Dutch trading company specialized in fine chemicals as a first step in his career. Starting at the bottom of the ladder, he was able to become familiar with every aspect of the trade. It did not take long for him to make the transition to international markets. When he then left this organization to make his own way in the world, he had already built a solid international network. It is this network of clients, suppliers and manufacturers that ultimately proved essential to what the B&S Group would become. This extensive network enables us to satisfy any and all of our clients’ needs. We serve our clients worldwide from our head office in the Netherlands. Clients that have, in some cases, been with us for decades.